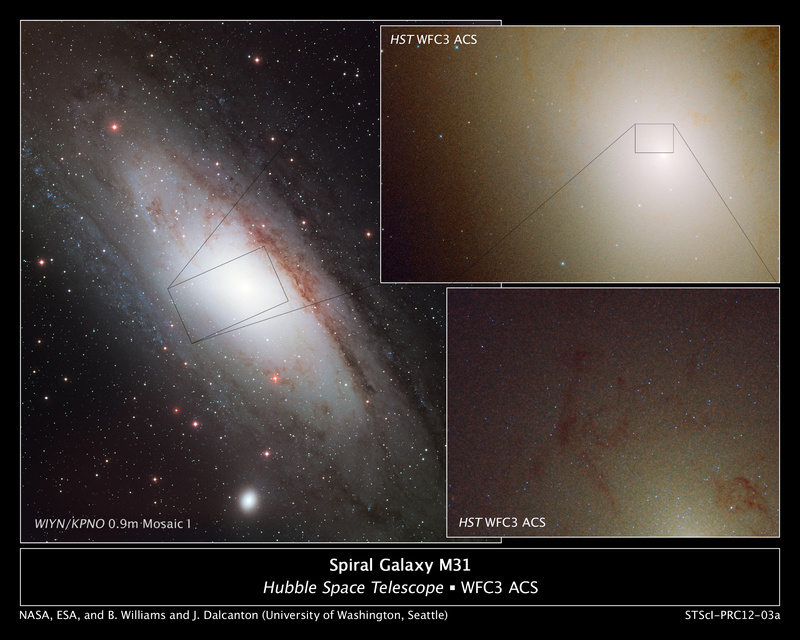 Peering deep inside the hub of the neighboring Andromeda galaxy, NASA’s Hubble Space Telescope has uncovered a large, rare population of hot, bright stars. Blue is typically an indicator of hot, young stars. In this case, however, the stellar oddities are aging, sun-like stars that have prematurely cast off their outer layers of material, exposing their extremely blue-hot cores. Astronomers were surprised when they spotted these stars because physical models show that only an unusual type of old star can be as hot and as bright in ultraviolet light. The telescope spied the stars within 2,600 light-years of the core. After analyzing the stars for nearly a year, Dalcanton’s team determined that they were well past their prime. As these stars evolved, puffing up to become red giants, they ejected most of their outer layers to expose their blue-hot cores. When normal sun-like stars swell up to become red giants, they lose much less material and therefore never look as bright in the ultraviolet. The astronomers have proposed two possible scenarios to explain why these blue stars evolve differently. According to Rosenfield, the most likely scenario is that the stars are rich in chemical elements other than hydrogen and helium. In this scenario radiation from the star is more efficient at pushing on gas laced with heavy elements, which drives away the material, like wind moving a thick sail. Although all the stars in the core are enriched in heavy elements, the bright blue stars may contain especially high amounts, which help trigger the mass loss. The study also shows that the number of blue stars decreases with distance from the core, tracing the drop in the amount of heavy elements. Another possible explanation is that the blue stars are in close binary systems and have lost mass to their partners. This mass loss would expose the stars‘ hot cores. The astronomers’ next step is to create simulations of these stars to try to determine which scenario is the one that leads them on a different evolutionary path.